Since the sixties, Köppern has been a full-service contract manufacturer for ECM-processed workpieces, from unmachined parts to finished products. We have modern ECM die-sinking machines available that can process workpieces each weighing anything from 20 g to 15,000 kg. With its many applications, including machine and plant engineering, gas turbine or aerospace technology, ECM has become a well-established manufacturing process. Electrochemical machining has proved to be superior to other forms of processing, particularly when it comes to ‘exotic’ materials where cracks must be avoided and a high surface quality is required, as for example in the aerospace industry. 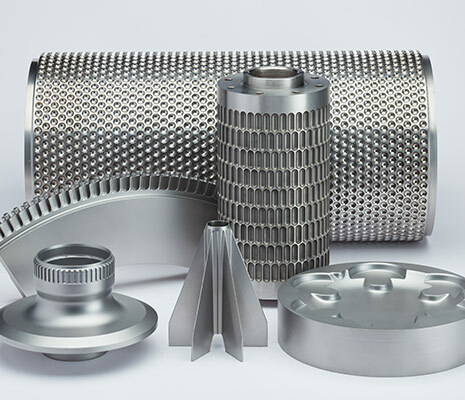 The forming of high-alloy materials, such as nickel-based or titanium alloys, or powder-metallurgical/hardened materials, is also unproblematic. The machining process produces a flash-free, high-grade surface quality without thermal stress, as the processing temperature is below 90°C.